Back in April of this year on this blog, we wrote about several business leaders, all veterans, who are now or have been captains of industry. We wrote about, for example, how FedEx was founded by Marine Corps veteran, Fred Smith and how the company is the 10th-largest private employer in the United States. Despite this accomplishment by a Marine Corps veteran and similar achievements by veterans of many of branches of the military, some recruiters fail to see how skills obtained while serving this country translate over into the civilian workforce. This is unfortunate. Here are just a few of the many, many important skills that members of the armed forces acquire that can be used in the civilian workforce as well. Leadership: No organization can thrive without strong, effective leadership. Leadership requires strategic planning, intelligence and the ability to inspire others to be their best. Sounds like any organization you know? These attributes are gained through service in the military as are problem-solving skills. Communication: Employers need and appreciate managers who can communicate to their subordinates exactly what is required of them in an unambiguous manner. Effective communication skills help in all job interactions and help in the task of goal setting and mission execution. The ability to follow orders: The ability to follow orders is an integral part of every workplace environment no matter what your position is in that company. This and obedience are instilled in people who serve in the military from basic training onward. Problem solving: Effective problem solving skills are some of the most important assets a new hire can bring to a job. The ability to think on one’s feet and adapt when things go wrong are all part and parcel of effective problem solving. Teamwork and collaboration: Most employers aren’t looking for iconoclastic individuals who want to go their own way. That is because in nearly all of life’s endeavors more can be accomplished through teamwork and cooperation. Yes, all these are so-called “soft-skills” that easily transfer over into the civilian workforce. They are a part of a skill-set that each recruit learns and carries with him/her for his/her entire life. The acquisition of this knowledge is a reason to be proud of serving in this country’s military. You can also express your pride in the Corps when you purchase an item from our USMC store. 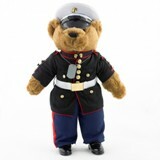 We have many items from books and videos to clothing and Marine Corps jewelry. Often, one of the biggest hurdles in the job search process for veterans entering the civilian workforce is convincing potential employers that the skills that they acquired during their service will be an asset to them. So, while this challenge can be great, it is not insurmountable. (Anyway, when has a Marine not been eager to accept a challenge?) To help you meet this challenge, eMarine PX offers you these tips to help you conduct a job search that will result in a quick and decisive victory. Get ready for battle: Many vets are surprised at how difficult it can be secure employment after having served our nation. But it should not be. It has always been somewhat harder for veterans to secure employment in the civilian workforce. According to the site Monster, post 9/11 vets had an unemployment rate of 6.9% in April 2015 vs. the non-veteran rate of 4.9%. Equip yourself: Take advantage of programs that help you transition from military to civilian life. These resources can provide you with the confidence and tools you need to approach civilian employers. Use military/civilian alliances and resources: Certain civilian businesses recognize that we as a nation can do more for our veterans by giving them with the opportunity to excel in the civilian workforce. These businesses have formed alliances with the military to supply job seekers with tools such as career counseling, resume enhancement, interview training and online skills training. Network: There are many groups of ex service members that are willing to help vets who are entering the job market. This is because veterans have a sense of camaraderie that is seldom seen among civilians. Seek out such organizations to find out what its members can do to aid you with your job search. It really is a shame that some employers cannot see how the skills and experience veterans have acquired through their service to the nation can also be an asset to their businesses. The good news is that things have gotten better in recent years than they were in the past. Great men and women have transitioned successfully from military careers to the civilian workforce and are now members of government and leaders of industry. Whether you decide to enter the civilian workforce or make a career out of the military, we are sure you will want to continue to show your pride in the USMC. Do so by proudly displaying one of our USMC hats and other clothing. Is your son or daughter contemplating a career in the Marine Corps? Has he or she seen the many advantages of serving such as the opportunity to serve one’s country, see the world, learn a specialty and carve out an upward path for his or her life? Well, as our readers know it takes more than the desire to join the service to become a vital part of this nation’s military. First, Marine recruits must go through 13 of the most grueling weeks of their lives. We know that parents who have served will want their sons and/or daughters prepared for such a challenge. Here are some ways to prepare your child for boot camp. Perhaps no organization places a higher priority on physical fitness than the US Marines. First and foremost, your son or daughter should prepare to be tested physically. We recommend that you first educate your son or daughter about Marine Corps testing standards. For example, he/she should know that they will have to take the Initial Strength Test (IST) which of course includes pull-ups/flexed-arm hangs, crunches, and a timed run. If your son or daughter is a natural athlete this will be helpful. If that is not the case, suggest to them that they may wish to start a workout routine in the months leading up to joining the Corps. Also, be sure that he/she eats healthy meals for the nutritional support they will need. Of course the preparation for becoming a Marine involves more than just a test of one’s physical stamina. It also involves a test of one’s intelligence, focus, and character. Be sure that your child knows that a great deal of discipline and willingness to follow orders/instructions is a key part of basic training. Otherwise, his/her time with the Corps will be short, uncomfortable and unproductive. Also, be sure that your child is someone who can take responsibility for his/her actions and is a team player. Iconoclasts do not do well in the services. In short, even civilians have heard about the rigors of boot camp. It is a grueling and demanding experience that tests one’s mettle and sorts out who will become a valuable asset to his/her unit and country and who will not. Make sure that your child reflects your pride in the Corps before joining what may be a family tradition for you. You will also want to be sure that he/she is prepared to face the physical and mental rigors that lie ahead. Also, show your pride in the Corps with our USMC items and Marine Corps products. Gift giving can be as anxiety-inducing as it is rewarding. That’s because we want to give our loved ones gifts that will be useful and that they will also cherish due to the thought that we put into selecting them. For visitors to our site a large part of the riddle of what kind of gift to give someone is already solved. After all, visitors to our site already know that the intended recipient of their gift is dedicated to the Corps and its ideals. However, with the large variety of USMC Marine Christmas gifts that are available on our site, choosing just the perfect gift for a current or former member of the Marines Corps can still pose a problem. For that reason, we would like to offer you the following suggestions for selecting just the right gift for your loved ones. Listen to what they say; observe how they act: Often people will drop hints as to what they need or desire in conversation. Sometimes our loved ones will even point out specific items they might like to receive when they are in our presence. Keep your antenna up particularly around the holiday gift giving season for such clues and let this be a guide. Take notes: Whether you do so using a pad and pencil or simply keep mental notes, make a list of gift ideas and refer to it while shopping. Ask the person what they need: It won’t be a surprise when you use this technique, but it will avoid any ambiguity. Some people are direct and very specific about their needs and will let you know right up front that they would rather be pleasantly surprised rather than just surprised. Make a list of all the things the person is interested in: Beyond the Corps, what is the intended recipient interested in? Do they like to read? If so we have many books available on our site. Are they a collector? If so we have coins, coin holders and other items of interest for collectors. Are they especially proud of their car? We have license plate frames, hitch covers, etc. too. Ask other friends, family members, etc: You may get an entirely new perspective from someone else when trying to come up with gift ideas. In short, some of the anxiety that comes along with gift giving can be lessened by taking a little time and carefully thinking out your strategy. Be it a gift like our Marine Corps hats for sale or our decals and stickers, your loved ones will appreciate a carefully thought out gift the best.